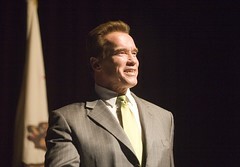 In May 2009, Governor Arnold Schwarzenegger announced an initiative “to make California the first state in the nation to offer schools free, open-source digital textbooks for high school students.” Math and science texts were emphasized. California currently spends about $400 million per year on textbooks. Of the 16 free digital textbooks for high school math and science reviewed, ten meet at least 90 percent of California’s standards. Four meet 100 percent of standards, including the CK-12 Foundation’s CK-12 Single Variable Calculus, CK-12 Trigonometry, CK-12 Chemistry and Dr. H. Jerome Keisler’s Elementary Calculus: An Infinitesimal Approach. A group that did very well in the initiative was CK12.org, a non-profit dedicated to using open source approaches to reduce the cost of textbooks for K-12 students around the world. They call their textbooks “Flexbooks,” and they’re available as PDFs under a Creative Commons Attribution-Share Alike 3.0 Unported License (CC-BY-SA). Another non-profit with a similar profile and mission — Curriki (combination of “curriculum” and “wiki”) — didn’t fare as well, in one case only meeting 3 of 46 content standards. It was started in 2006 by Sun Microsystems. Interestingly, Pearson Education‘s biology textbook only met 31 of 67 content standards. The list of standards not met is very long in the final report. CK12.org has also partnered with Virginia to expand its efforts. According to a story in the New York Times, the digital divide will slow progress around free digital textbooks. Many students don’t have computers still, especially laptops that make digital texts more usable. But with $400 million on the table in one of the nation’s largest economies, it may be only a matter of time before that money is redirected toward closing that divide. 1 Thought on "Free Digital Textbooks Win in California"